This mini-documentary captures a thought provoking campaign with the sole purpose to increase awareness into Parkinson’s disease. Starting on World Parkinson’s Day (April 11), various Sydney cafe’s were thrown off balance to highlight the fact that Parkinson’s affects everyone. Over 1,000 wooden wedges (the kind you use to hold a door open) were produced with a message printed clearly on each side. 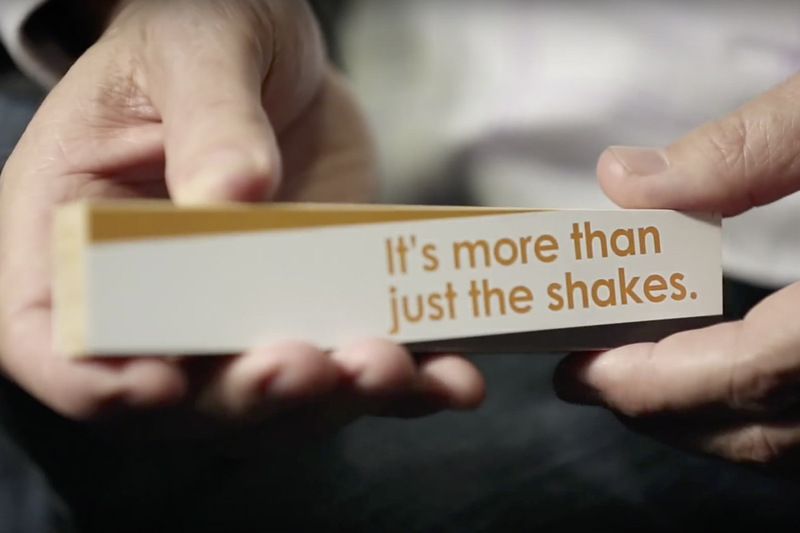 One side of the wedge showed the title of the campaign, “It’s more than just the shakes.” When flipped over, the printed copy read, “Thirty Australians are diagnosed with Parkinson’s disease every day. But thousands more are affected, from family to friends. You can help stop it at shakeitup.org.au”. The wedges were placed under various tables in cafés and restaurants. Cameras recorded people’s reactions to their wobbly tables, spilled coffees, tipped sugar bowls and of course, their reactions to the wedge messages. The stunt itself was designed to spark a conversation about Parkinson’s Disease and address the misconceptions that PD is just ‘an old people’s disease’, and about ‘having the shakes’, but more affects everyone connected to the person with PD — from family and friends to co-workers.